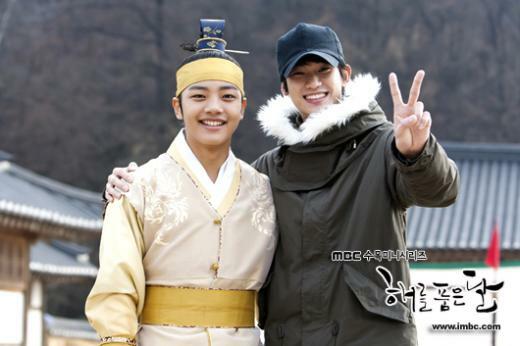 MBC drama The Moon that Embraces the Sun breaks its highest ratings record continuously, and the popular adult actor Kim Soo Hyun was going to the filming set to cheer for the child actor Yeo Jin Goo who plays his role during young age. Recently in early January 2012, the photo of Kim Soo Hyun cheered for the children before he officially started the filming was published on the website of The Sun and the Moon. Kim Soo Hyun was taking photo together with Yeo Jin Goo who plays the same role in the drama, and they showed happy smile, leaving deep impression. And the fact that both of them used to appear in the same drama is attracting attention. Kim Soo Hyun and Yeo Jin Goo used to star in SBS 2010 drama series Giant together. They played the role of Lee Sung Mo and Lee Kang Mo during their young age. Kim Soo Hyun was born in 1998, while Yeo Jin Goo was born in 1997. Although with the 9 years of age difference, but the youth look of Kim Soo Hyun allowed him to appear as a child actor in Giant. In The Moon that Embraces the Sun, the affectionate first love of young crown prince (Yeo Jin Goo) encounters setback, after growing up, Kim Soo Hyun is catched up in a whirlpool of love can not be achieved, all these are attracting the attention of the audience, the voice of the audience’s expectations is getting higher and higher. Kim Soo Hyun, Han Ga In, Jung Il Woo, and other adult actors will debut at the end of episode 6.